Product #2745 | SKU ESAC03UCW | 0.0 (no ratings yet) Thanks for your rating! 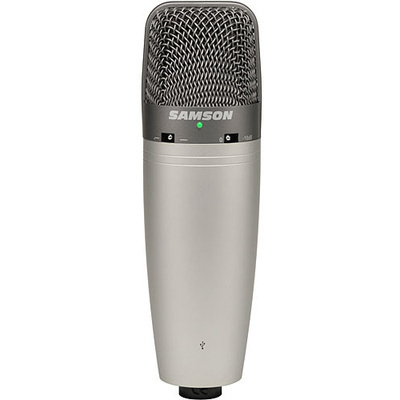 The Samson C03UCW is a cost effective, multiple pattern studio condenser microphone designed for project studio applications. High-speed USB output provides direct connection to desktop and laptop computers. The C03UCW provides super-cardioid, omnidirectional and figure 8 polar patterns. Variable patterns provide the flexibility necessary to capture instrument and vocal signals in any recording scenario. Dual 19mm capsules ensure high level and low noise floor on output. Also featured is a 10dB Pad switch that provides extra headroom when capturing excessively loud audio signal, preventing peak distortion. A hi-pass (low-cut) filter switch eliminates noise caused by hum wind and low frequency ambiance. The C03UCW features a USB output and for direct connection to laptop and desktop PCs. Power is also provided through the USB connection. The C03UCW is a multi-pattern condenser microphone that provides super-cardioid, omnidirectional and figure-8 pick up patterns. The high-pass filter switch eliminates low frequency noise due to wind, hum and ambiance. The 10dB pad switch provides additional head room when capturing excessively loud audio signal that can cause peak distortion.